Just like most everyone else, I have been reading a whole assortment of literature that predictably came out in the aftermath of Super-Typhoon Haiyan, a.k.a. 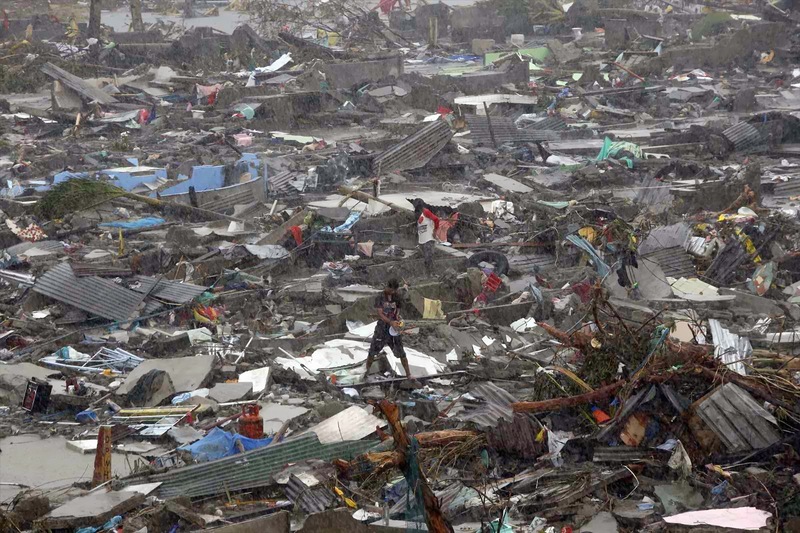 Yolanda in the Philippines. I have seen the praises, the rants, the counter-rants; even the petty Korina Sanchez-v-Anderson Cooper spat. Not being on the ground and having been primarily dependent on media reports on what has been happening on-site, I have chosen to reserve judgment on the matter of the government’s response efforts. I have wracked my brain for ways by which the scale of the tragedy that unfolded before our very eyes right from the day Yolanda crossed the archipelago might have been avoided. I have found none. Nature, when it throws a fit, invariably wins. Short of evacuating everyone along the super-typhoon’s path, which was logistically impossible, anyway, the result always was going to be that devastation in terms of loss of lives and infrastructures would be massive. However, certain things can be gleaned from the experience, not only of the super-typhoon itself but also of the subsequent disaster response. There will be, naturally, costs involved – transportation, storage, food, lodging, etc. – but, at the end of the day, that most basic of human necessities – i.e. food and water – need not arrive four or five days after the fact. Whatever costs these amount to cannot possibly greater than the cost of that which we see with heartbreaking clarity each and every night beamed into our living rooms by the primetime news. The Philippine Government WAS prepared. I do not always agree with this government, but I always take the stance that praise should be given where praise is due. I have lived on this planet for more than half a century, so I am qualified to say that this government in my lifetime is the one that has taken the BEST attitude towards disaster preparedness and management. I find this praiseworthy because, after all, the Philippines is not only along Typhoon Alley; it is also part of the Pacific Ring of Fire. In other words, living in the Philippines is somewhat akin to Russian roulette. Every weather system that spawns in the Western Pacific along with every tectonic plate that shifts is potentially catastrophic. We just never know which one will be. Being as it was that Haiyan/Yolanda was seen as the most powerful weather system ever to make landfall in recorded history, its potential for destruction was unknown. Not totally, because Bopha/Pablo, which wreaked havoc in Mindanao just last year, offered clues that whatever damage Haiyan could bring would be worse. In fact, one PAGASA spokesperson, when asked about the threat that Haiyan posed, replied simply with “delubyo.” I have always understood this word to pertain to a cataclysm. Thus, while the exact damage was at the time unknown, that it would be massive was obvious to government scientists. There is this fairly well-known ‘principle’ that was originally stated in the context of mechanical engineering but is also, in a wider sense, very much applicable to management. It is called Murphy’s Law, which is summed up in a simple but profound statement, “What can go wrong will go wrong.” Applied to engineering or even management, it is a challenge for the visualisation of a worst case scenario. In hindsight – which, it is said, is always 20/20 – the much-maligned government response in the aftermath of Haiyan was based on an erroneous worst case scenario. Government’s disaster planning and response is structured; i.e. it is reliant on the hierarchical system of local government. Thus, relief is pre-positioned on-site for quick response by local government for citizens victimised by natural calamities. Most other times, this will make sense. However, Haiyan was not ‘other times.’ It was packing heretofore unknown winds in excess of 300 kilometres per hour and the strongest-ever seen in the entire world in recorded history. In its bulletins, PAGASA repeatedly warned that Category 5 systems were capable of uprooting trees, ripping off roofs and blowing in devastating storm surges – exactly as we all saw once video footages from local and international media started to stream right into our living rooms. Therefore, the defined worst case scenario should have been, in critical areas, a WIPE OUT. I will not criticise government because, at the very least, it TRIED to prepare. That said, one question that government will have to ask itself for future preparedness now that its existing system has been exposed is how could everyone have missed that all the relief that it had pre-positioned along with the local officials tasked with disaster response were just as vulnerable in the face of such a monster as ordinary citizens. Preparing disaster response with a wipe out as a worst case scenario changes the protocol. This does not have to be done for every weather system that threatens to make landfall but only for those that will be potentially cataclysmic. Needless to say, PAGASA will have to play a major role in changing the worst case scenario. In anticipating a wipe out, it will make more sense to ship relief OUT rather than in. Similarly, while mass evacuation is logistically impossible, shipping out officials of responding agencies should be so much more manageable. Although predicting tracks that weather systems will take is not a hundred per cent foolproof, it has nonetheless dramatically improved in the last few decades primarily due to research and improved technology. Haiyan, for instance, stayed more or less true to its forecasted track. If weather systems deviate from their tracks at all, these days it is seldom dramatically far from what has been predicted. The worst destruction is always close to the eye of a weather system, where the wind gusts are strongest. If the diameter of the most destructive winds can be identified and factored into the forecast track with possible deviations included, then relief goods along with officials of responding agencies can be temporarily shipped outside of the diameter, for quick redeployment once conditions improve. This is, of course, an oversimplification; and the logistics cannot possibly be covered in one article. Government will have to have the will to commandeer ports and transport vehicles to be able to mobilise heavy machinery, engineers, medical professionals, law enforcement officers and many others. There will be, naturally, costs involved – transportation, storage, food, lodging, etc. – but, at the end of the day, that most basic of human necessities – i.e. food and water – need not arrive four or five days after the fact. Whatever costs these amount to cannot possibly be greater than the cost of that which we see with heartbreaking clarity each and every night beamed into our living rooms by the primetime news. Acknowledgment: Top photo from http://www.worldvision.com.au.